A jumbled mess of a cover. Seems appropriate. Years ago an alien artifact crashlanded on Earth, a giant cube known as the Allspark. Years after that explorers found a giant metal head under the ice, which zapped the lead explorer in the face and drove him mad, leaving strange symbols on his glasses. In present day a US military unit in Qatar is attacked by a helicopter resembling one shot down in Afghanistan except it transforms into a robot. One group of soldiers manages to escape with a picture of the robot but is stalked by a robotic scorpion. In America a boy named Sam Witwicky is trying to sell the items once owned by his grandfather, the explorer from earlier, so he can afford his first car. He also finally gets to talk to his crush, a girl name Mikaela who has a knack for cars. Then one night Sam’s car takes off. He follows it and sees it also transform into a robot, sending a symbol into the air like the Bat-Signal. Of course the police don’t believe him. The craziness has just begun. Look, by now most of you know the movie. You know what it did right and wrong. The funny thing is the adaptation sort of fixes what the movie did wrong, but by necessity. The robots still look a mess but the art tries to make that work. For example, when Blackout attacks the military base he’s in shadow to beef up the mystery. While Scorponok takes his sweet time attacking Lenox’s unit it’s a good reveal when he finally does. The way the panels are drawn makes the fight between the Secret Service and Frenzy aboard Air Force One more visually interesting, and that already wasn’t a bad scene in the movie. What really is improved is some of the more cringe-worthy moments, which come off as padding when they’re removed. The used car salesman is less of a stereotype, and we don’t get that stuff about his momma or any of that other nonsense. Sam doesn’t look like he’s trying the old “oh gee, the car is having a problem and we’re out in the middle of nowhere” thing and just jumps into Mikaela trying to fix it to establish her father for later as well as her mechanic skills. The scene with the soldiers on the chopper coming back to base doesn’t have blatant New Orleans stereotype solider going off. Best of all the scene with the cop is seriously cut down so we don’t get that jackass detective trying to make Sam go for his gun. We do lose the gag where Ron pulls that small joke on Sam by going to the Porsche dealer before heading to the used car lot, and sadly we keep the forced “more than meets the eye” reference from this part of the movie but those are surprisingly minor quibbles. So for this first issue my compliments to the writer and the art team. They actually made this part of the movie better, and that’s from someone who for the most part liked the first movie. It’s just the sequels that disappointed me because at least the first movie had some potential. So you might want to try this instead of the film if the other three issues hold up. 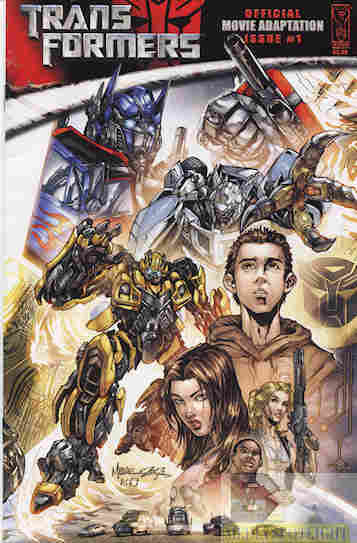 Posted by ShadowWing Tronix on November 1, 2018 in Movie Spotlight, Yesterday's Comics and tagged Blackout, Bumblebee, comic adaptation, IDW Publishing, Michael Bay, Sam Witwicky, Scorponok, Transformers (film series). The cover art reminds me of the artwork from the He-Man/Thundercats comic book of 2016/2017. I wonder if it’s the same artist.